Please click here to donate to the Dr. Eileen Holden Emergency Endowed Scholarship. The Dr. Eileen Holden Emergency Endowed Scholarship was established to honor Polk State’s fourth president and her 11 1/2 years of service to the College. At the June 2017 District Board of Trustees meeting, with more than 100 College staff, faculty, students, and community members in attendance, the Trustees and the Polk State College Foundation presented Dr. Holden with a most unexpected gift–a check representing contributions made to the Dr. Eileen Holden Emergency Endowed Scholarship Fund. 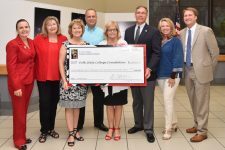 Foundation Chair Bonnie Parker presented Polk State’s fourth President with a check in the amount of $130,493–the total value of the contributions made by the community to the scholarship fund in her namesake, in recognition of her outstanding service and achievements. The emergency scholarship fund is particularly important to President Emerita Holden. Emergency scholarships, serving more than 100 students annually, are awarded to individuals needing small-scale tuition or textbook assistance. Often, without this support to bridge a financial gap, students will “stop-out” of school, delaying completion of a degree.